FORT BRAGG, N.C. — Army Sgt. Bowe Bergdahl, who was held for five years by Taliban allies after walking off his post in Afghanistan, will soon learn his punishment after pleading guilty to endangering his comrades. A military judge began a second day of deliberations Friday after hearing closing arguments by defense attorneys, who asked for no prison time, and prosecutors who are seeking 14 years behind bars. Army Col. Jeffery Nance called Bergdahl and lawyers for both sides into court Friday to let them know that he was returning to his chambers to continue deliberations. He didn’t give an indication of when he would hand down Bergdahl’s sentence. Bergdahl faces up to life in prison for desertion and misbehavior before the enemy. Wearing a blue dress uniform, Bergdahl appeared tense during the short morning session. He clenched his jaw as if grinding his teeth, then grimaced and looked at the floor when he walked out of the courtroom. A psychiatrist testified that Bergdahl’s decision to leave his post was influenced by a schizophrenia-like condition called schizotypal personality disorder that made it hard to understand consequences of his actions, as well as post-traumatic stress disorder brought on partly by a difficult childhood. Oshana also cited Bergdahl’s own words to argue against the idea that his thinking was clouded. On a courtroom monitor he displayed quotes from an initial investigation after Bergdahl returned to the U.S. Bergdahl, who has said he walked off to draw attention to problems with his unit, described to an investigating officer how he envisioned the missing-soldier alert unfolding. 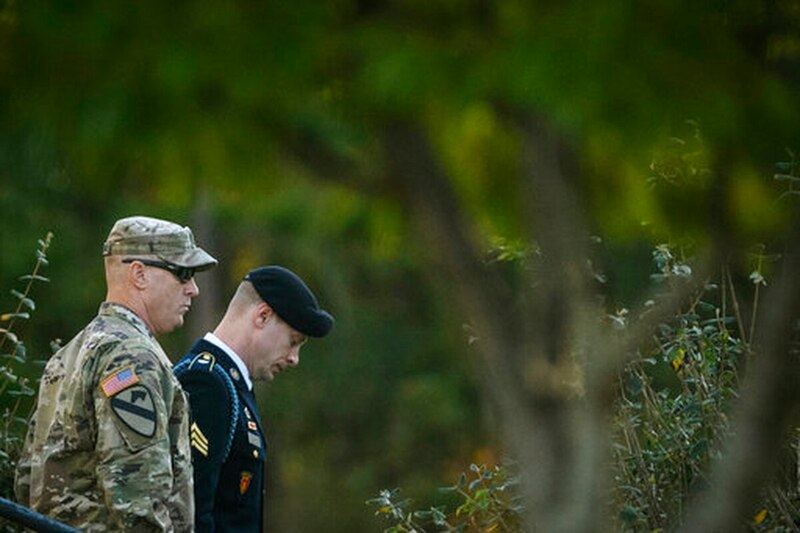 Bergdahl pleaded guilty Oct. 16. The judge has wide discretion on sentencing because he didn’t strike a deal with prosecutors to limit his punishment. A bad conduct or dishonorable discharge would deprive Bergdahl of most or all his veterans’ benefits.